The tours of „Sandwich Harbour 4x4“ start from Walvis Bay at 08:30 am or, for guests that take part in the boat excursion in the morning, at 1 pm. Great opportunity to combine the two tours are possible and highly recommendable. 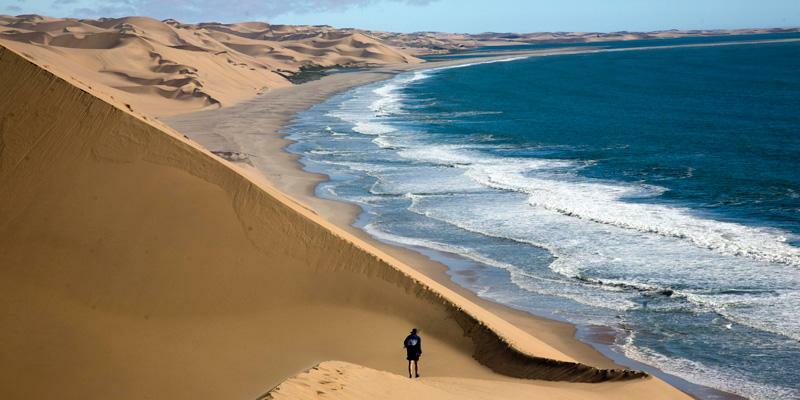 After a short stop at the Walvis Bay Lagoon, often crowded with flamingos, the tour continues towards the Kuiseb Delta and the salt works directly to the wild Atlantic coast where dunes and ocean meet south of Walvis Bay. Accessibility with the off-road cars to the lagoon is dependent on high and low tide. If the tide is high the last meters to the Lagoon have to be taken by foot over the last dunes. Here enough time is given to enjoy the breathtaking landscape, to take pictures, to search for the well camouflaged Little 5 or to get a decent sunburn should you have forgotten to cover yourself thoroughly with factor 50 sunscreen.